SWEEEET!!!! Another week of training done and more fitness gained. This week was my longest training week; my coach had me at 22:30 hours this week. Add this in to the fact that it’s been eight days since my last off day and I still have tomorrow’s weight training and you can imagine that I am one tired dude! In fact before it’s all said and done, I’ll have around 28 hours of training since my last off day (for those that don’t know, this is quite a bit). I can say though that I can feel myself getting stronger and I’m ready to begin tempo training in another week or two. I was thinking about writing an article about how to read and use the Performance Management Chart in WKO+ (and trainingpeaks.com for that matter), since I saw this fatigue coming and could plan on it. I’ve also been discovering how food plays into my training more. I’ve noticed, for the last several months, that I’ll often have a good day followed by a bad day on the bike. I decided that I was going to actually track my calories carefully for a week and see what I was doing (whether that be bad nutrition, too many calories, etc). What I discovered was pretty shocking! It turns out that I generally shortchange myself by around 800 calories a day. It’s strange to thing that this is the case because I don’t normally feel hungry and, when I am, I eat until I’m not anymore. So, this weekend I’ve made a serious effort to ensure that I am eating all of the calories I need and it’s been A LOT more food than I thought it was going to be. Holy crap! I 1) never realized how much I was under eating and 2) had no idea how difficult it would be to eat this much! I did have some misfortune, on today’s ride I was meandering up an easy hill in Louisville and my front shifter broke. I pulled off on the side of the road and play with it for a for minutes and discovered that one of the pawls in the inside of the shifter itself had broken. Since there was nothing I could do about it, I had to just rough it the rest of the way home in the big chain ring up a few more hills. It made for a crappy 15 minutes, but it all worked out. I plan to take my bike to the shop tomorrow to see if I can get it warrantied or fixed since I’ve only had this gruppo for a couple of months. That’s all for this week’s update! Martins Putelis taking the plunge! WIth all of this excitement about me going to the Tour of the Gila, I figured this would be a good time to chat a bit about recovery during stage races. After all, it’s the guy who recovers best that often takes home the crown especially when we are talking about five days of hard racing. There’s no better way to trash your body then to not feed it the nutrients and calories it needs to start the recovery process. Currently, I end a ride with a bottle of Recoverite and then, I follow this up with a medium sized meal (400-500 calories) plus another bottle of water; I may also add a pretorian shake late in the evening if I don’t have a lot of natural protein on hand. I’ll also eat larger meals for the rest of the day to take care of the rest of my bodies needs. Less than this and it’s a show stopper for me. It’s not uncommon to see riders starting to fade in subsequent days of competition and, after talking to them, they’re barely eating enough to keep themselves conscious. I can thank Matt Gibble of Raining Faith Message (rainingfaith.com) for this part of my recovery. Last year I went to a self message clinic of his and, since incorporating this into my training, I can safely say that I feel more relaxed at stage races and find I sleep better when I flush out all of the toxins from my legs after tough riding/racing. The routine he showed me takes around 15 minutes, but is more than worth the time and effort. I highly suggest seeing Matt to learn more about self message as well as other sports message needs. He’s working with athletes of all flavors for 20+ years and really knows his stuff. I know, this sounds crazy, but don’t knock it until you try it. Fill a bathtub with water until it sits a little under waist deep. Then, fill the tub with loads of ice until the water comes up over the tops of your thighs. According to current research, it’s only necessary to hang out in the tub for 15-20 minutes, so it’s not like you have to sleep in there. Let me warn you, when you first get out, your legs are going to feel like cinder blocks, but when you wake up the next day, you’ll feel totally fresh! I’ve also recently become a fan of compression tights when I don’t have a metric ton of ice at my disposal. I purchased the Zoot compression tights on a whim (a fairly expensive whim) and I’m extremely please with the results. I don’t think they are as good as taking an ice bath, but it isn’t particularly common where I have the ability to take one, so I was really in search f something else when in a pinch. Generally I need to wear them for around four hours to get the maximum effect. That’s it for my recovery process for now. Question, comment, new ideas? Comment below; I’d love to hear what others are doing! Another week gone by, another week of training under my belt. It’s been fairly uneventful with an emphasis on uneventful. The weather hasn’t been cooperating much lately and the early days are pushing me to the trainer more and more. I think I may go postal in the near future if I can’t get outside to ride more. There’s something about riding inside that drives me to the edge of sanity and I’d prefer to to back off from that edge a bit. The good news? We’re supposed to stay in the high 40’s to low 50’s for the next week, which is perfect cycling weather. A little on the cool side, but comfortable. I did make one major decision this week regarding my training and racing. I will be participating in the 2011 edition of the Tour of the Gila. This five day stage race will pit me against some of the top Cat 3 talent in the country and it boasts tons of climbing each day. Even the time trial and criterium’s profile look more like hill climbs than traditional races. The event takes place April 27-May 1st and I couldn’t be more excited. Time to get back to training! My coach has me doing another high volume week in preparation for some serious stage racing! I’ve recently been looking over some of my old training data and racing to results to get a feel for what worked well last season and what didn’t. And, so far, I’m find the information incredibly useful. I thought it might be a fun idea to share a little bit about how I track my training/racing. WKO+. 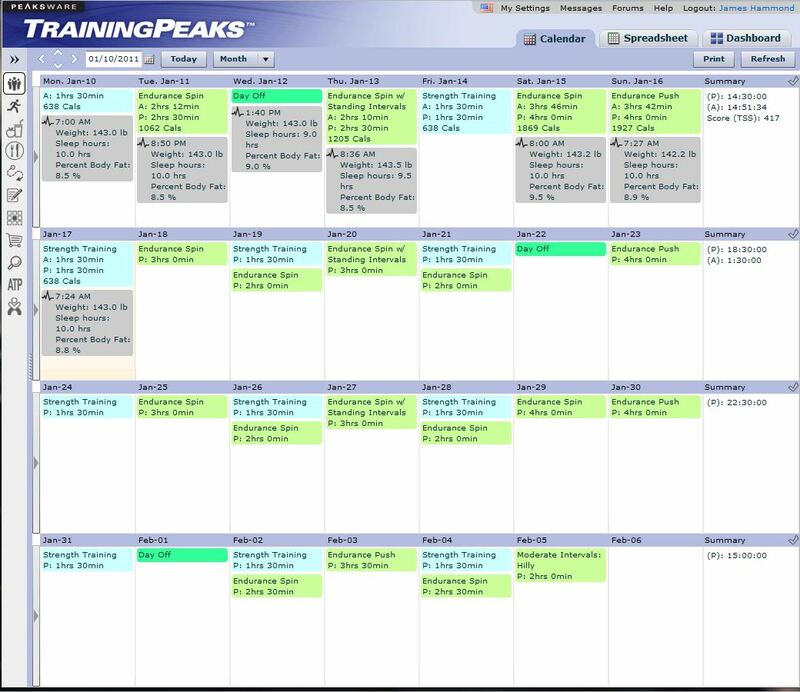 Essentially, TrainingPeaks.com allows you to both add planned workouts and then go back and input what you actually did. This includes things like power/heart rate data, GPS, and your own personal description of the workout. You could probably do this to track race data as well, but I’m not sure their system is quit robust enough as it stands. From looking through my planned vs. actually training time I can see that when I was most “on my game” was when I had a plan through a coach. You wouldn’t think that having a coach is really handy, especially with all of the free information online, but, at least for me, it made a world of a difference. I became accustomed with keeping a training log after one of my team mates, Tim Sranski, wrote a blog article about the importance of one near the beginning of the season. Since then, I’ve kept a pretty comprehensive race log with such mundane entries such as the weather, number of competitors, course type, etc all the way down to the important stuff such as how the races actually unfolded. Not only has this information proved invaluable from a training perspective, but I think it will also come in handy when it comes time to do some of these same races again. With 30+ races and many more actuall race days last year, it’s difficult to actually remember how everything went. Being able to reflect on what happened last year prior to the current year’s race will provide me some insight as to how things might unfold this year. There’s nothing like being one step ahead of the game! 1) After a three weeks of V02Max work, I race like a champ. 2) My current strenght is flat, technical criterium courses and my biggest weakness are courses that feature short “power climbs” (those that take less than five minutes to top). Now that I know some of my strengths and weaknesses as well as what kind of training works, I can go formulate a more precises training program with my coach as well as cherry pick some races that have features that suit my abilities! How do you guys track your training and racing? Any notable difference. Comment below! Colorado sure knows how to do it. 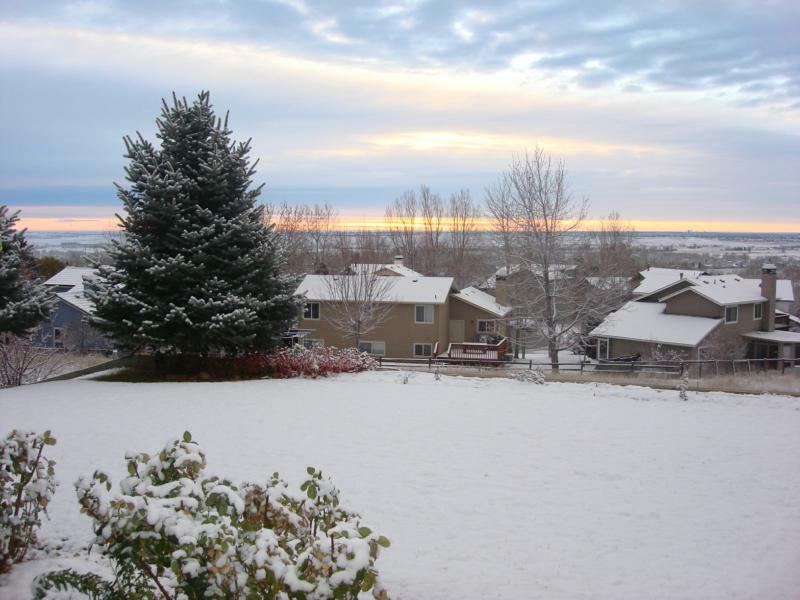 Most states get their snow during November and December, but not Colorado. We’ve been getting weekly snow for the past couple of weeks. Thankfully, the snow comes early in the week and leaves by the weekend, so long rides aren’t a problem. But trainer rides all week are starting to drive me INSANE! I’ve tried going for a few runs and a swim or two, but those just don’t quite have the same effect on me as riding. They’re just not quite as fun. Saturday’s team ride was great though! It was good to get out with the guys for a few hours of endurance riding. I saw a lot of old faces and a few new ones. It’s pretty incredible how our junior squad has nearly tripled in size since last year and I bet they are going to clean up the BAR/BAT titles for next season. Not to mention the SM4 and P12 squads have also gotten a serious boost in numbers. The SM3 team on the other hand is going to go through something of a transformation this season. Many of the seasoned vets who have been an SM3 for a long time upgraded to the P12 team and are leaving many of the fresh SM3 behind. There are some massive leadership roles to fill, but I’m optimistic that we won’t have any problems filling them. The biggest issue I see is going to be keeping the SM3 BAR title. Many of the guys that upgraded were extremely strong in certain disciplines and could often pull of big results without huge amounts of team work. I foresee that the remaining SM3 guys are really going to have to bad together and push each other to get results this season. Unfortunately, I had to peal off at Hygiene to get some food and I discovered some that made me sad. The gas station that has been servicing cyclist since I first started riding (and probably before) has finally gone out of business. It was always the placed that I stopped to fill bottles and get a Hammer Bar or two before heading off to Carter Lake or taking Hygiene road off in to the mountains for a day of climbing. Anyone else seeing big changes around them for the 2011 season? Maybe they’re roster changes or a favorite rest stop gone out of business, possibly new additions to family and changes in how you’ll have to structure your training? It’s that time again, people are making New Year’s Resolutions. For some, that means purchasing a gym membership, quitting smoking or organizing your life. How am I doing so far? Great! I’ve eaten virtually all unprocessed “clean” calories since the first as well as not had a soda. Instead I’m drinking gallons of tea in hopes that the sugar cravings will end soon! I’ve been told by friends that quit drinking soda and other sugar infused drinks that the cravings are going to last a while depending on how addicted to the white powder (read: sugar, not cocaine) I was. Which was a lot. I also haven’t missed a single day of training, albeit it’s only been four days. The legs and body feel good right now. Here’s hoping that 2011 brings some stellar experiences my way!